Lovers of the countryside and the splendid northern coastline of Cornwall will find spacious and comfortable accommodation awaiting them at this pretty barn situated in the hamlet of Trevenning. Close to the picture postcard village of St Tudy and only two miles from the head of the Camel Trail ideal for cycling and only four miles from the lovely Port Issac harbour town and beaches. Couples and families alike will be enticed outdoors to the large gardens or, with picnics at the ready, take long scenic walks in the nearby fields, or venture further on the lonesome moorlands nearby at Bodmin. Little light pollution means that this is a great place to look at the stars and planets on a clear night. 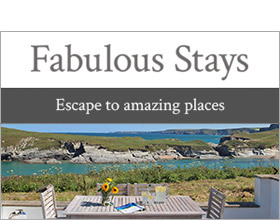 A peaceful spot just handy for the Atlantic Highway (A39), the cheerful seaside towns and villages at Port Isaac (8m), Padstow (14.3m) and Boscastle (11.5m) and pleasant sandy shores of Polzeath (12.9m) and Trebarwith Strand (7.5m) there is almost too much choice! The popular local pub, The Tudy Inn serves fantastic food, and nearby towns can be explored by keen shoppers. The beamed ceilings, thick granite stone walls and other nooks and crannies add to the charm of this large property that gives plenty of access to surrounding lawns and gardens and neighbours the owner's residence of Trevenning Farm and the quaint two person Trevenning Chapel (property reference 1516) tucked away in a walled courtyard. There is a great farmhouse kitchen, separate utility, twin room and shower room on the ground floor with hallway and staircase leading to the rather large living room with wood burner and French doors leading down to the garden. There is plenty of parking for two or more cars. Over two floors. Two bedrooms: 1 x first floor double, 1 x ground floor twin. Ground floor shower room with shower, basin and WC. First floor family bathroom with bath, shower over, basin and WC. Ground floor kitchen/diner. First floor sitting room.